A broader understanding of the print world, so that I can better empathize with the marketing designers that I help oversee. The best thing about the book is the thoroughness of the content. I had a particular background that I worried would make some parts of the book redundant and others impenetrable, but in the end it hit me squarely where I needed to learn.” –Tim Chisholm, Creative Design Lead, Resolver Inc.
“A quick reference “OMG, this has EVERYTHING” guide. And I got it! and I wanted something that would help teach designers in a sequence that would make sense, and something they could look back on for a refresher. I needed a great book that inspires and can teach my students about the complexities of printing. Also a book to use as a reference to look up information about printing for someone who rarely does print jobs any longer. An in-depth book about production as it relates to printing which this book honestly goes above and beyond in providing. The depth of its coverage and valuable information. I especially love the charts showcasing the cost-effectiveness of the various kinds of printing…genius! Thank you for taking the time energy and resources to build this book and to create this resource for our community.” –Sean Bacon, professor of graphic design at San Diego City College. Nowadays, there are so many methods of print in use; offset, letterpress, digital printing, silk-screening, engraving and more. To know the limitations and advantages of each method can be confusing, and not knowing can be costly for designers and their clients. 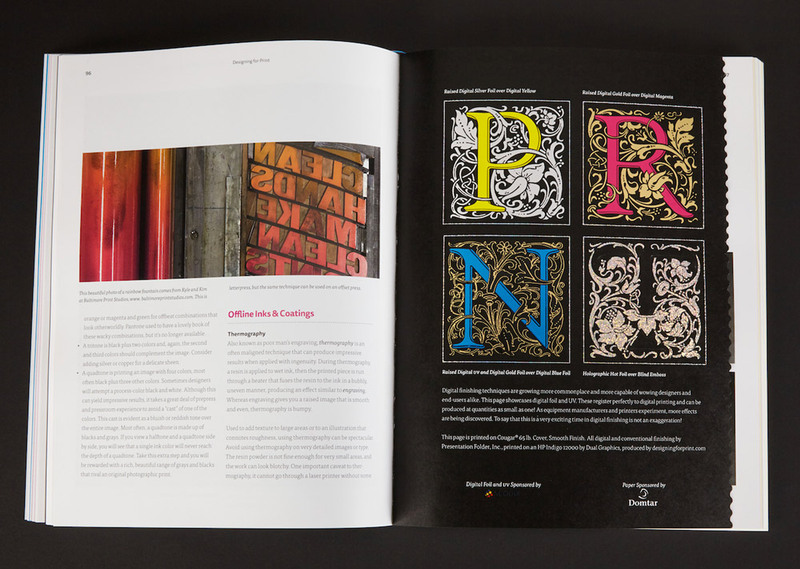 Designing For Print contains all the know-how graphic designers need to work with printers and achieve amazing results. Designing For Print is perfect for working pros, students, and digital designers who need to design and print successful projects. Price discounts are available to instructors wishing to adopt the book for classroom use and for businesses who wish to create a special edition as a customer promotion or gift.